← Where did Phobos and Deimos form? When did the Martian dynamo die? Current thinking among Mars scientists holds that the Red Planet’s dynamo — the geo-engine in its molten core which generates a global magnetic field — was active soon after the planet formed, but turned off about 4 billion years ago. Spacecraft in orbit have detected and mapped magnetic fields in parts of the ancient southern highlands and elsewhere. While these show no active global dynamo pattern, they indicate that Mars had an internally generated magnetic field at one time. Yet the field disappeared at some point because the Hellas, Argyre, and Isidis impact basins — about 4 billion years old — contain no magnetic signatures. These would have been printed into the impact-melted rocks if a global field had been present when the basins formed. But is this ancient age in fact correct? New work by a team of scientists led by Colleen Milbury (Purdue University) and published in the Journal of Geophysical Research suggests the dynamo shutdown happened more recently. If true, this means that Mars kept its magnetic field longer — and this would have protected the atmosphere for longer as well. A magnetic field strong enough to leave traces in once-molten rocks would deflect most energetic solar radiation and ionizing particles, thus preventing them from eroding the atmosphere. But when the dynamo died, the Martian atmosphere began to die with it. Today’s Mars has no global magnetic field, only a thin atmosphere, and solar radiation and particles can strike the surface unhindered, making conditions hostile for most forms of life. The Milbury team notes, “The presence of a dynamo indicates that the core is rapidly losing heat, a condition necessary for driving geologic activity… Volcanic and tectonic activity on Mars were much more intense during the Noachian, and had ceased in all but a few areas by the end of the Hesperian.” The Noachian epoch lasted from the formation of Mars until about 3.9 billion years ago, when the Hesperian Epoch began and continued down to about 2.9 billion years ago. 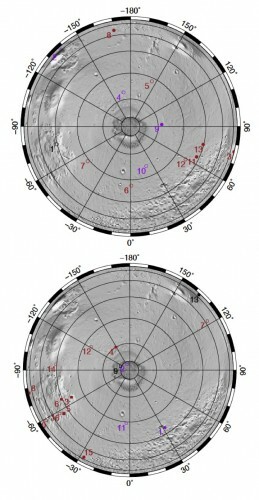 Correlating gravity maps of Tyrrhenus Mons and Nili Patera and Meroe Patera (both part of Syrtis Major) with nearby magnetized rocks, the team found 29 anomalies that can be dated. 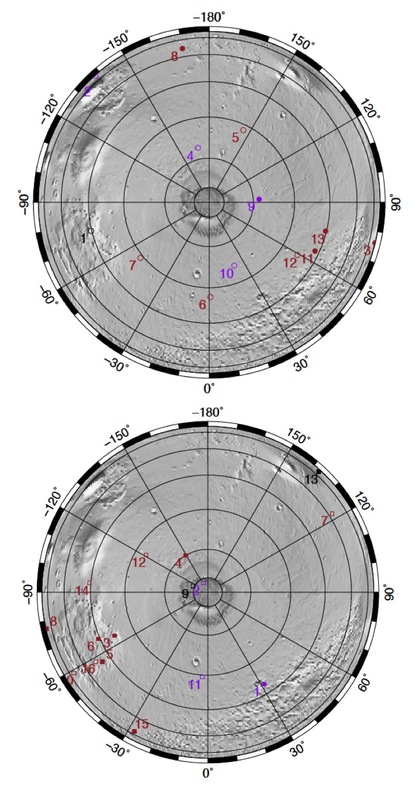 The paleopole positions determined by the magnetic fields suggest that Noachian (older) locations had a magnetic pole that was closer to today’s Martian equator, while Hesperian (younger) sites had magnetic poles closer to the current rotational pole. This implies, they explain, that Mars has shifted its rotation axis since Noachian times, perhaps due to the growth of the large Tharsis volcanic province. The excess mass erupted there would have shifted the Martian spin axis to make Tharsis equatorial, as it currently is. Finally, they note that evidence for magnetized rocks, and therefore the existence of an internal dynamo, peters out in the Hesperian, roughly 3.6 billion years ago. This entry was posted in Reports and tagged atmosphere, core dynamo, dynamo, magnetic field, Meroe Patera, Nili Patera, Tyrrhenus Mons. Bookmark the permalink.